Born: 18 December 1821, Aberdeen, Scotland, United Kingdom. Died: 6 June 1867, Sydney, Australia. John MacGillivray, natural history collector, was the son of William MacGillivray, a prominent ornithologist and at some time professor of natural history at Marischal College (University of Aberdeen), and his wife Marion McCaskill. For some time John studied medicine in Edinburgh, but before he could qualify started to focus on natural history collection. He published two papers in the Annals of Natural History in 1842, one on the zoology of the Outer Hebrides and the other on the zoology of the neighbourhood of Aberdeen. That same year he accepted an appointment as naturalist under Professor J.B. Jukes on board the Admirality surveying vessel HMS Fly, on a four year long expedition to the south-western Pacific Ocean, especially around the Great Barrier Reef. Leaving England in April 1842 the expedition called at the Cape on both the outward and return journey. 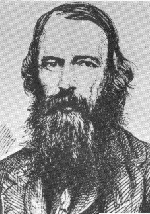 He returned to England in 1846 with important collections of mammals, birds, fishes, invertebrates and plants, and published three papers in the Zoologist that year: "An account of Raine's Islet..." (on the north-east coast of Australia), "Ornithological excursion..." (to the north coast of Australia), and "Notes on Australia, natural history". In December 1846 he set out again as the official Admiralty naturalist on HMS Rattlesnake, in the company of assistant surgeon Thomas H. Huxley*. The ship was sent to do survey work in the Torres Strait (between Australia and Papua New Guinea). They arrived at Simon's Bay on 8 March 1847 and stayed for a month. During the expedition MacGillivray married Williamina Paton Gray in Sydney in 1848. They eventually had a son and two daughters. The expedition returned to England in November 1850, again with important collections, especially birds. MacGillivray published his Narrative of the voyage of HMS Rattlesnake... during... 1846-1850 in London in 1852. It included contributions by specialists on the fauna that had been collected. He also published three papers on the natural history of some of the places he had visited. In 1852 he left England again, this time as a civilian naturalist on the survey vessel HMS Herald, on an expedition to South America, the South Pacific and Australia. The ship called at the Cape in November 1852 and during its stay he collected some 300 species of plants, some of them with W.G. Milne, a horticulturalist on the same ship. MacGillivray developed a drinking problem and was dismissed in Sydney in 1855. From there he undertook some excursions to various Australasian islands to collect natural history specimens and study the native inhabitants. Descriptions of his work were published in the Sydney newspapers, while he also continued to publish natural history papers to 1860. However, his life ended in alcoholic obscurity and his published work, except for his account of the voyage of HMS Rattlesnake, is regarded as of little importance. He was, however, a critical and intelligent observer with an excellent knowledge of zoology and animal distributions and his large collections of especially birds, mollusc shells and plants included type specimens of many species. The mollusc genus MacGillivrayia was named in his honour, while plant specimens collected by him are in the herbaria of Kew Gardens and the Botany Department of the British Natural History Museum. MacGillivray, John. Australian dictionary of biography. Retrieved from http://adb.anu.edu.au/biography/macgillivray-john-2401 on 2018-7-18.